Three years after the outbreak of war in Syria, the agony only deepens for its civilian population. The conflict has already killed 140,000, forced 9.5 million­­—44 percent of the nation’s prewar inhabitants—to abandon their homes, and led some 2.5 million Syrians to flee to neighboring countries, including Lebanon, Jordan, Turkey, and Iraq. Syrian refugees now constitute more than 20 percent of Lebanon’s population, on top of 400,000 Palestinian refugees already present. In January, the United Nations sponsored a conference in Kuwait City, requesting that international donors provide $6.5 billion in emergency assistance for the victims of the Syria conflict—a figure dwarfing any previous humanitarian appeal. The scale of this effort underscores the magnitude of the human tragedy in Syria. It also points to broader strains and dilemmas confronting the humanitarian enterprise globally. Multiple crises are stretching global humanitarian response to the breaking point: Syria is not the only complex emergency confronting the UN system and its member states. 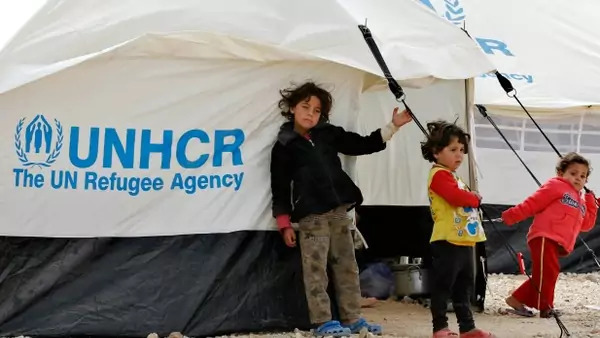 Even as they seek to ease suffering in Syria, relief agencies are coping with massive flows of refugees and internally displaced persons (IDPs) in South Sudan and the Central African Republic (CAR). The UN’s Office of the Coordinator of Humanitarian Affairs (OCHA) has designated all three (as well as typhoon Haiyan) as “Level 3” crises—the highest degree of severity. In South Sudan, fighting between the government and insurgents has generated an estimated 708,900 IDPs. The situation in CAR is even more calamitous, as sectarian violence has driven an estimated 950,000 people (mostly Muslim) from their homes, including 300,000 across international borders, particularly to Chad. Thanks to these three crises—and others around the globe, like in the eastern Democratic Republic of the Congo (DRC)—the world now has more refugees and IDPs combined than at any other time. Nontraditional donors have failed to fill the gap: The surging demand for humanitarian assistance is coming at a bad time. Traditional Western donors are exhibiting “aid fatigue” after two decades of seemingly unending crises and exhaustion with nation-building efforts in Afghanistan, Iraq, and elsewhere. To help supplement aid from OECD nations, the United Nations and the United States have appealed for greater support from emerging donor nations, including China, India, and the Gulf states. The results have been underwhelming. The brightest newcomer has been Kuwait, which has pledged and delivered $500 million for Syrian refugees. Saudi Arabia and the UAE, in contrast, have been comparatively stingy. New donors also appear more inclined to let political calculations influence their decisions on relief aid. Witness the miserly Chinese response to typhoon Haiyan in the Philippines, which is locked in a struggle with China over sovereignty claims in the South China Sea. Protracted humanitarian crises require different approaches from brief, fast onset emergencies: Conventional wisdom associates humanitarian response with the fast delivery of relief to cover acute emergencies, including natural disasters and man-made catastrophes. This model, still embraced by some relief agencies and NGO aid workers, is ill-suited to chronic or protracted humanitarian crises. In Syria and its surrounding countries (as well as Somalia and Kenya, Afghanistan, and Pakistan), displacement has become a fact of life, with tens, even hundreds, of thousands inhabiting massive camps. Beyond providing food and shelter, donor agencies and NGO providers must take a longer-term perspective informed by development principles. In response, the UN system is now pushing its own agencies and other donors to adopt a common planning framework that links provision of relief aid with longer-term efforts to improve health and education and provide for displaced populations. Along similar lines, governments, UNICEF and other international actors recently launched a “No Lost Generation” initiative targeting the estimated five million children in Syria who have suffered deeply during the war, including spending the last three years without formal schooling. “Humanitarian space” continues to shrink: Since the “invention” of humanitarian action in the mid-nineteenth century, actors providing emergency relief in the midst of war have counted on combatants to respect their special status, guaranteeing their physical safety and access to victims on all sides of conflict. In return for this “humanitarian space,” relief workers have generally embraced the principles of neutrality, impartiality, and independence. Since the end of the Cold War, however, humanitarian workers have increasingly found themselves as pawns and targets of belligerents, particularly by rebel forces, insurgents, and terrorists. In Afghanistan, humanitarian workers complained bitterly (if controversially) that U.S. and allied military forces exacerbated this problem by conducting their own “humanitarian” operations for political and intelligence purposes, thus blurring the lines between humanitarian actors and soldiers and exposing the former to targeting. The conflict in Syria has thrown the problem into even sharper relief, with both sides, but particularly the Assad regime, using humanitarian actors as pawns in their ongoing struggle. USAID has sought to prevent the diversion of aid by both the government and the rebels, including through the use of bar codes to track supplies. However, the government in Damascus continues to pursue a policy of “kneel or starve,” obstructing delivery of relief supplies to rebel-held areas and diverting supplies to regime sympathizers. This explicitly violates UN Security Council Resolution 2139, which passed unanimously on February 22, and insists on unencumbered humanitarian access—both across lines of control within Syria and across Syria’s borders. Violations of international humanitarian law jeopardize traditional rules against intervention into sovereign states: Both sides in the Syrian conflict, but especially the Assad regime, have directly targeted civilians and civilian infrastructure, including schools and hospitals. According to UN secretary-general Ban Ki-moon, “some 200,000 people are under siege in government-controlled areas.” Particularly heinous has been the government’s continued use of barrel bombs, in direct contravention of resolution 2139. Deployment of these weapons, intended to terrify and inflict horrific casualties on those perceived as sympathetic to the rebel cause, constitutes a clear violation of international humanitarian law. The deliberate targeting of civilians clearly reinforces the argument for international intervention consistent with the “responsibility to protect” doctrine. But even absent such targeting, the Assad regime’s obstructionism of life-saving humanitarian aid raises two critical policy questions: First, at what threshold does blockage of emergency assistance justify coercive action against a sovereign state to ensure its delivery? Second, when does a regime’s denial of life-saving aid to its civilian population constitute a crime against humanity, for which perpetrators may be held accountable to international justice, whether in the International Criminal Court or some other venue? The Syrian crisis has exposed critical challenges for the future of the humanitarian enterprise, which—for all its faults—surely represents one of most remarkable achievements to reduce suffering in human history. Around the world, emergency relief continues to save thousands upon thousands of lives. Even in Zimbabwe, ruled by Robert Mugabe’s iron fist, a remarkable 86 percent of people requiring aid have received it, according to a recent report. Syria reminds us just how fragile these accomplishments remain, and how the brutality of civil war can challenge cherished humanitarian principles.